Gracie and Rachel are a study in duality: light and dark, classical training with a pop sensibility, Californians in New York. Their music pits anxiety and tension against an almost serene self-assurance on their self-titled debut, and their live show is equal parts fierce drama and delicate intimacy. Their music is a compelling juxtaposition of Gracie’s piano and lead vocals and Rachel’s violin and voice, augmented with stark percussion. The nine orchestral-pop songs on Gracie and Rachel tell a story that’s rooted in the truth —their truth — but retain an enigmatic air that makes them relatable to anyone who has ever found their heart racing with doubt and pushed forward regardless, or triumphed in subverting expectations imposed from without. Their story begins when they met in high school in Berkeley, California, in a dance class, and were assigned a musical collaboration that took hold. After attending music schools in different parts of the country, they moved to Brooklyn where they built out a loft space to be their studio and home. That’s where they started writing the songs on Gracie and Rachel, “living, working, breathing every moment together, and making music in that universe,” says Gracie. Their close-quarters creative process lends a sense of urgency to their music that cascades through the rollercoaster arc of the album. Baeble Music hailed opener “Tiptoe,” with its eerie ghost tones and taut percussion, as “beautiful and unsettling,” a description that applies to the spacious piano and sympathetic violin on “(Un)comfortable,” or the hammering piano part on “Go,” all the way to the ringing vocals that build to a defiant crescendo on “Don’t Know” to close the record. Gracie and Rachel pair their music with a strong visual aesthetic that emphasizes the ways in which they complement each other, even as they contrast. It’s evident in their striking black-and-white videos that play with light and shadow, and in the photo that graces the album cover, where Gracie, dressed in white, covers Rachel’s eyes with her hand while Rachel, dressed in black, covers Gracie’s mouth. NPR Music named “Only A Child” as one of their Top 100 Songs of 2017 and Bob Boilen picked Gracie and Rachel as one of his Top 10 Albums of the year. Congratulations G and R! Bob Boilen called Gracie and Rachel’s debut album “one of my favorite albums of 2017.” Watch their Tiny Desk performance here and catch them opening for Ani DiFranco 11/3-6! 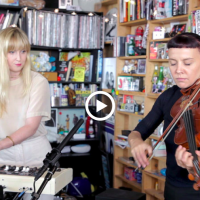 Watch Gracie and Rachel live at Paste Studios NYC here. With the help of producer and friend John Fredericks (John The Baptist), Gracie and Rachel put their spin on Sia’s “Elastic Heart. Their version premiered on BlackBook.